Besides appreciating the definitions they offer for arts engagement, also I am interested in how our exhibitions, events, and classes address our community and in turn alter professional artists’ practice. Have you taken art classes? If so, how have they affected your experience of art? 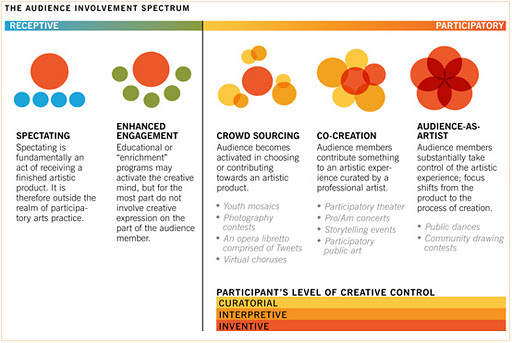 Artists, how have you involved audiences in your art? Most of the Oklahoma Visual Arts Coalition staff is soaking up knowledge and enjoying colleagues at the Oklahoma Arts Conference in Tulsa. We value learning from experts in the community development, advocacy and other cultural topics thanks to the Oklahoma Arts Council (a state agency). Artists need different types of money for their practice. To seek outside funding, artist need to distinguish between the two. One type of funds cover the ongoing sustenance of their practice– day in and day out expenses like rent, normal materials, etc. Let’s call this ongoing expenses. Other types of funds pay for special things like a one-time project, travel, specialized training, major changes in scale of your practice and such. This could be considered “project” funding. Projects are mostly what grants will fund. Usually grants pay for one-time, special, or time-delimited projects. Meanwhile, things like art sales and day jobs are more reliable income to cover ongoing expenses. Merit-based awards can be bonus funds to help as needed also. Artist with the ability to make more of their expenses fit into or a part of projects are able to package their work better for grants. Feel free to check out the resource pages we created for the workshop here and I welcome your comments. September 29th marked the first ArtistSurvival Kit (ASK) workshop of the season. This year’s topics were nominated by the ASK committee with much discussion and input from previous workshop attendees and voted on by OVAC members in an online Facebook poll. The topic of creative collaborations was of interest to many OVAC members and the actual workshop did not disappoint. The 22 participants heard lectures from local forensic artist Harvey Pratt who works closely with the Oklahoma State Bureau of Investigation, and artists Justin Strom and Lenore Thomas who make collaborative art under the name, Satan’s Camaro. The topics of discussion and means of collaboration were drastically different and had many in the audience thinking of different ways they could adopt collaborations into their own practice. The workshop was co-hosted by the School of Fine Arts at the University of Oklahoma and was followed with an intimate gallery preview of Satan’s Camaro, Medieval Tehno Show currently on display through October 21, 2011. Pratt’s lecture was intense, interesting and graphic. He showed detailed examples of how he works with victims, witnesses and psychics to create forensic sketches to identity suspects. He also discussed his role in working with law enforcement to identify bodies, create age progression assessments, and ultimately, capture criminals. His lecture provided great insight on collaborating with a much larger organization such as the OSBI and suggested the unexpected collaborative nature of working for the good of those who are no longer living. After a brief question and answer session, a talk by the printmaking duo Satan’s Camaro followed. Strom and Thomas are an eclectic and likable pair. They each discussed their individual projects prior to collaboration and showed examples of their early collaborative efforts. Their newer work has evolved to become complimentary yet cohesive- the fruit of compromise which has matured over the past 5 years. 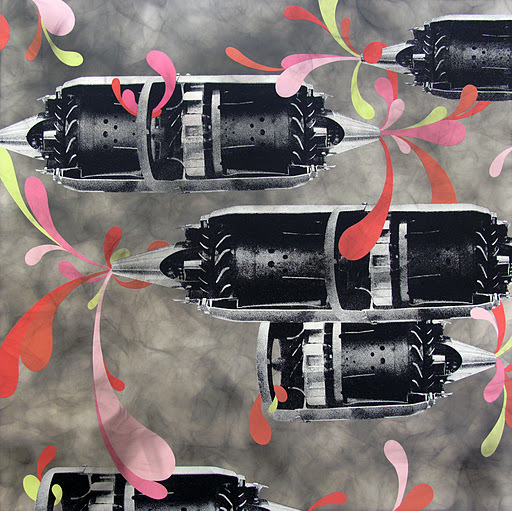 Strom and Thomas share vital roles in their practice and manage to make work that is of each of them, yet different. It was truly refreshing to see great work being made, collaboratively without egos spoiling the fun. More information can be seen on their website at http://satanscamaro.com/home.html. The next Artist Survival Kit workshop will take place November 19, focused on curators, emerging artists and preparing for exhibitions. What does it feel like to win the top prize? 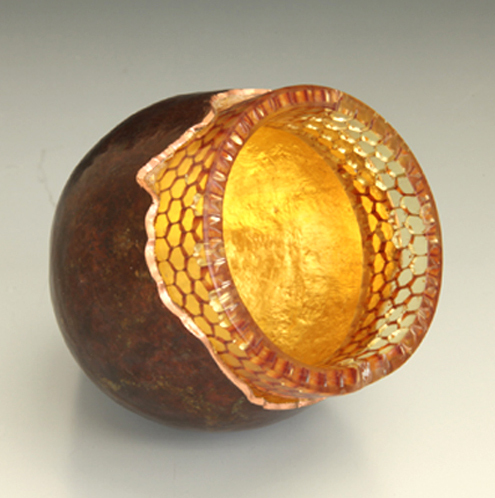 Lopeeta Tawde’s was awarded the Curators’ Choice at Momentum Tulsa for her work Copper Vessel recently. I interviewed her to learn more about her work and techniques. The Stillwater artist attends Oklahoma State University. Julia Kirt: What was your idea behind the piece? Lopeeta Tawde: Currently I am working on the body of work inspired from the nature and organic entities that are perceived as a tangible embodiment of attraction. Copper Vessel is inspired from the similar idea but reflects the other aspects of beauty that nature exhibits beneath its inhomogeneity and complexity whose form is of a purely structural origin. The vessel reflects discord and goes against the traditional perception of attractiveness. I intend to challenge this notion through my art by making jewelry out of these core organic materials as a metaphor for internal beauty. JK: How did you create Copper Vessel technically? LT: Copper Vessel is raised from the 18 gauge copper flat sheet by sinking and raising technique. A disc of desired size of vessel to be raised is cut into a circle. I used 6″ diameter copper sheet. Before proceeding towards the sinking process, I punched the center of the circle, and drew concentric circle with the scriber at regular intervals using the compass. I annealed the sheet to make it soft. Then with the use of raising hammers, anvils and stake I raised flat sheet of metal into a hollow-ware object. 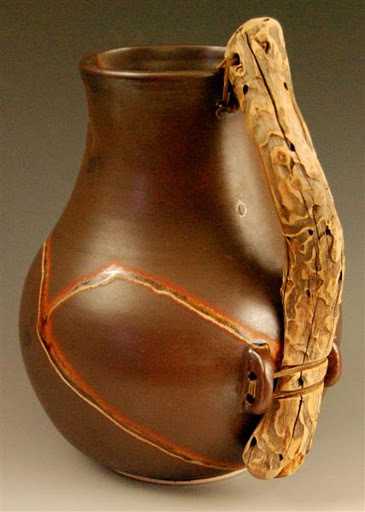 I had attended artist David Haung’s workshop in Spring 2011 that provided me with the intricate knowledge in technicalities of raising vessels. Furthermore, I developed the idea incorporating the organic form to traditional metal based object to enhance the beauty and create a nice transition between to two surfaces. I had cast honeycomb material with the resin, as resin helps to retain the originality of the material and leaves space for an imaginative interpretation to the viewer. JK: I’m interested in the works in different media you’ve presented at Momentum. Please tell us about your background and artistic training. LT: I am originally from India. 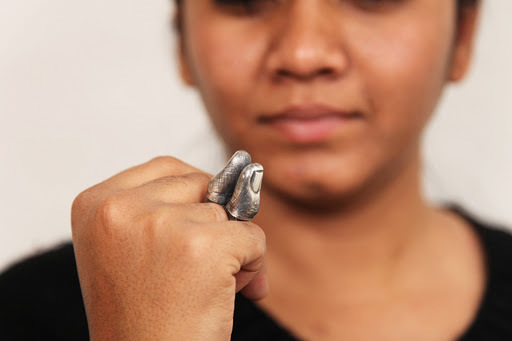 I received my BFA degree from Sir J J School of Arts, Mumbai, 2008 in Metal work. I studied Industry Oriented jewelry designing from Indian Institute of Gems and Jewels, 2008-09. Studying in such a prestigious institution has helped me hone my basic art skills and give art its special professional place in my life today. I always aspired to provide to the international dynamic creative community. My quest to explore and learn more in Jewelry Designing at a larger stage has brought me to Oklahoma State University (OSU). I got an opportunity to work with fine team of professors and Jewelry artists like Chris Ramsay, Sung Yoel Lee and Martha. As a secondary major; I am continuing to work with the watercolor medium under the guidance of Professor Jack Titus. I am currently working on the body of work inspired from nature and anticipate graduating year is spring 2012. I would further continue my education with residency or Master’s program to achieve professional and academia growth as an artist. JK: What was it like winning the top award? LT: It was my first time for participating in the Momentum show and I feel fortunate to have an opportunity to present my piece to the people of Oklahoma. I was excited to know that I have won a Curator’s Choice award and I was delighted with the people’s response to the kind of work I am doing. This award has truly inspired me to keep working on building a professional career as an artist. Momentum Tulsacontinues through October 27 at Living Arts of Tulsa, 307 E Brady. The free gallery hours are Tuesday-Saturday 1-5PM, plus until 9 pm on Thursdays. RobinWolf, an artist from Kingfisher, OK, recently received a Professional Basics Grant from the Oklahoma Visual Arts Coalition to help her attend the Western Design Conference. OVAC Intern Frances Hymes interviewed Wolf to learn more about her work and process. Learn more at www.robinwolfpottery.com. 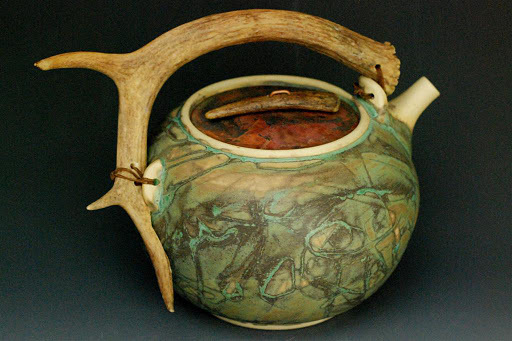 Robin Wolf, Jackson Hole Teapot, Ceramics, copper, antler. Frances Hymes: In your artist info you say that your pottery is to be used. Do you worry that your pieces will become worn and there won’t be pieces that endure over a long time, or do you have pieces that are set aside from use? Robin Wolf: I have started to; some of my older pieces I was bad about hammering them because they weren’t the same quality as today’s work. I didn’t value them. I do have a pitcher that I use on a daily basis that was the last piece that I made in 1986, the start of my 20 year hiatus from clay while I raised my three daughters. When I create my art, I really do hope that each piece is like trying on a pair of shoes. It’s just knowing how the handle fits in the hand. Some pieces, your hand just fits into the handle and the natural contours of the wood. FH: Is that the climax moment, the fit in someone’s hand or the finished pot? RW: For me when it all comes together is when the customer has that ah ha moment; when the costumer finds the warmth of the piece that fits them. FH: Do you have pieces that are hard to let go? RW: Yes, the Jackson tea pot. I have a brown jug that I haven’t sold that I don’t want to give up because the handle felt so good to me, but one of my friends picked it up and said “Oh my god. It fits like a glove!” Those are great moments for me when the balance of the pottery connects a person with a piece. FH: Your online gallery shows antlers being used as a handle. They have an organic nature. Is the renewing of material important in your work? RW: Yes. My husband and his brother farm and ranch, so the ebb and flow of nature is in every aspect of my life. I believe that we always have to pay it forward. I absolutely believe that you must always replenish the “well” if you want to continue to draw from it. FH: Do you believe in karma? RW: Yes. My grandfather always said “ill-gotten gains bring no good.” His words have always stayed with me, and his words cross over into everything I do, if it’s not earned, it’s not going to pay off; if you don’t replenish it won’t continue. FH: Are you a self-taught artist or did you go to school? RW: No, self-trained. It used to bother me but I’m proud of it now. FH: Did your work change after you took pride in your self-training? RW: Yes. In believing in yourself, you learn to have self-worth and self-pride. Belief in yourself is mandatory in order to continue to push the envelope. FH: What works in progress do you have going right now? RW: My first commission – it is a 12 place setting of dinnerware for a large ranch family. FH: Is it hard to create for commission instead of going off of intuition and letting creativity flow? FH: Has being featured in the “Discover Oklahoma” episode exposed your work to a broader audience? RW: It was great exposure. The producer is a dear friend of mine. I met her through Kingfisher Creative and it’s been well over a year and people still recognize me from Discover Oklahoma. FH: I guess it was a full-circle moment from being self-conscious about your work to being featured in an episode of Discover Oklahoma? RW: Yes it really was….. Me and Marilyn Monroe…. all the same! The Oklahoma Visual Arts Coalition provides artist project grants for growing artists’ careers, creative projects and exceptional continuing education. The next application deadline is October 15. Find guidelines and application here. Tell us about your concept for this piece. Laura Reese: My concept was at first just the hammer itself. I delighted in the irony of a sledge hammer carefully wrapped in bubble wrap and saran wrap. I wanted this object that is intended to be used to be made unusable. The source of these textures may not be evident to the audience but it becomes irrelevant by the placement of the hammer on the pillow. The pillow transforms the hammer from tool to ornamental object. Of course it also has some feminist interpretations. 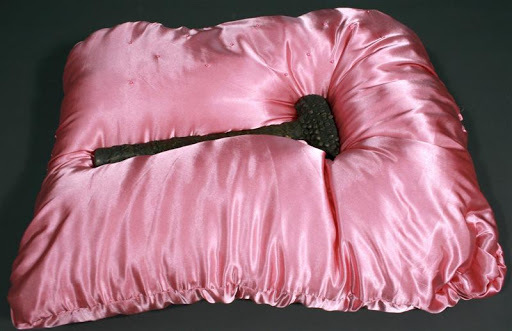 The pink could be seen as symbolic of feminine delicacy, and the suffocating plastic wrapping, as perhaps evocative of the intentional wrapping up of a woman’s power. The placement of a powerful object in a delicate context can diminish its power. LR: This work is part of a group of work using cast metal and silk. The other pieces similarly have themes of feminine identity, power and the simultaneity of femininity and energetic strength that has been rendered inconceivable by particular societies. My work, however, is not only about women’s issues. I try to work with objects that stand on their own, as each of the other pieces in this series do. Where else might audiences see your artwork? LR: My work can be viewed on my website at laurareese.net, and my work is often around Norman and the University of Oklahoma for different shows and events. Momentum Tulsa opens October 8 with live music, performance and visual art by 57 young Oklahomans. The exhibition remains on display until October 27 at Living Arts of Tulsa, 307 E Brady. Learn more or buy tickets here. Julia Kirt: Tell us about your concept for these photographs. Lathen Kamas: The goal for any of the photographs I take is to record a subject in a natural state where details and subtleties that are generally overlooked can be captured and explored. This is typically challenging to achieve due to the way that the introduction of a camera affects behaviors and/or situations. To me, the real story of a person, place, or object lies in the details, and these things can only truly be exposed when you are able to share a moment without interrupting the natural state or behavior of the subject at hand. 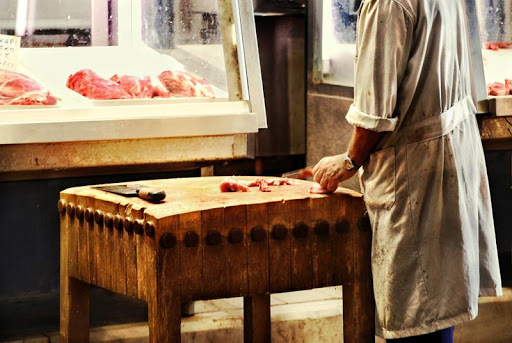 Small things like the way someone wields a knife, how a person shifts their weight when leaning against a wall, or how a shadow interacts with a subject can reveal another facet to a story. I search for the things in a seemingly ordinary situation that can cause a transformation into something extraordinary or unexpected. Exposing these moments and details can help redefine the way someone views what is taking place, and in turn, encourage them to focus on details that reveal more than what the broader picture initially communicates. This series is intended to reveal ideas and traits not generally associated with the type of environment that the subjects are in. 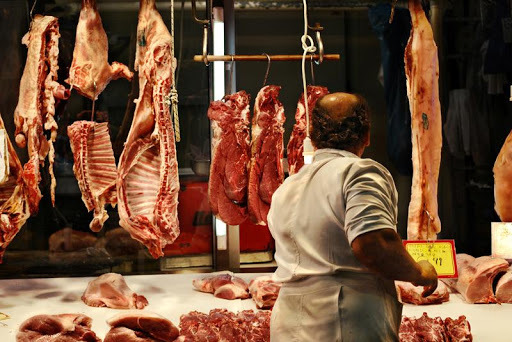 Despite the fact that this environment is generally recognized as a source of bloodshed, mutilation and primal behavior, the actions and states of the subjects are able to communicate things such as delicateness, precision, formality and a sense of content. The juxtaposition of such different ideas within the same environment was interesting and a great way to illustrate the importance of searching for and recognizing details. JK: Where else might audiences see your artwork? LK: As someone who is relatively new to photography, this is the first exhibition opportunity that I have pursued. Because of that, the walls of my home are the only other place to view more of my work. So until I decide to venture outward again, I am happy to share what I have captured with friends and family over food and drink here in my home.